Scott Scherer is Chief Information Officer for Jersey Mike’s Subs, a fast casual franchise restaurant chain known for its authentic fresh sliced/fresh grilled subs. Scott is responsible for all technology design and deployment for the 1,500 Jersey Mike’s restaurants open and under development nationwide, working with his team to create and manage a custom Point of Sale system that integrates programs and services for franchisees and the franchisor. These include PCI compliance; gift cards; online ordering; CCTV loss prevention systems; and enterprise reporting including food cost and labor management. 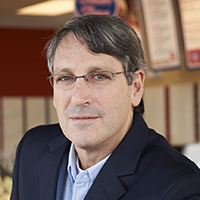 Under Scott’s leadership, Jersey Mike’s won a 2015 CIO 100 Award by CIO magazine and two Hospitality Technology Restaurant Breakthrough Awards, in 2014 and 2012, for the company’s single proprietary, fully integrated technology platform.